“Flu,” short for “influenza,” is a contagious respiratory illness caused by a group of viruses. Flu viruses can infect the nose, throat, and sometimes the lungs of human hosts, according to the CDC. Flu can cause mild to severe illness (and even death), including cough, sore throat, runny or stuffy nose, muscle or body aches, headache and fatigue. Fever may or may not accompany flu, and young children are more likely than adults to experience vomiting and diarrhea from flu. Some of the symptoms of flu are the same as those of colds. The fluandhealth.org chart, “Is it the Flu or the Common Cold?” can help you distinguish between flu and cold. History in a Name“Influenza” is an Italian term for “influence,” based on the historic notion that epidemics were due to the influence of the stars. Flu spreads mostly in colder months when people are most likely to be in close, indoor contact. The most important flu prevention strategy is getting vaccinated every year. Obtaining a “Vaccine by Halloween”2 provides optimum protection, but later vaccination is still very helpful. The vaccine takes about two weeks to become fully protective; flu season typically peaks in February. If you haven’t gotten your flu shot yet, it is not too late! Flu viruses mutate, making it difficult to know which ones will circulate in any given year, which is why we can become sick with flu multiple times throughout our lives. This year’s predominant flu virus strain appears to be an H3N2 variety, the same strain that caused record flu activity in Australia during the last Southern Hemisphere winter. 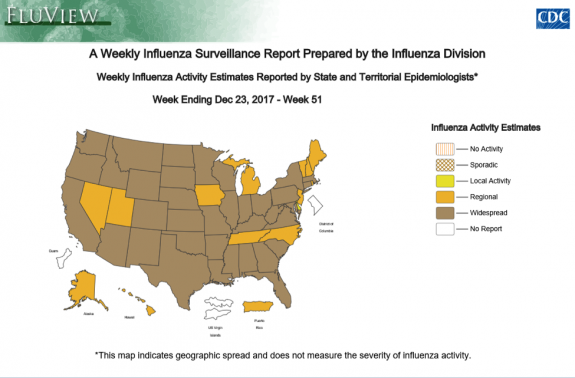 On December 27, 2017, CDC issued a health advisory recommending more and earlier use of antiviral medicines for treatment because (a) H3N2 virus-predominant flu seasons have been associated with more hospitalizations and deaths in older and younger age groups, and (b) flu vaccine effectiveness is generally lower against H3N2 viruses than other types of flu viruses. According to CDC, when the virus enters your nose, throat, or lungs, a protein on the virus’ surface, known as “hemagglutinin” (representing the “H” in H3N2) binds “like a key to a lock” to receptors on the surface of respiratory tract cells. Once that “key” is inserted, a flu infection has begun. Viruses require living hosts, e.g., you, to survive and multiply. Flu symptoms may appear in one to four days, but you may be contagious starting one day before symptoms appear and five to seven days later, according to an article in the British Medical Journal. As the virus multiplies, your immune system battles the foreign “invaders.” The battle duration, and therefore the period of infection, normally lasts three to seven days, resulting, most often, in victory–and a return to health–for the human host. Armed with information on what flu is and how flu spreads, we hope you will take steps to avoid becoming a human host for flu! 3 Clean surfaces first with detergent and water and then sanitize using 2½ tablespoons of high strength household bleach (8.25%) per gallon of water or ¼ cup regular strength (5.25-6%) bleach. Alternatively, wipe down surfaces with disposable pre-moistened wipes containing chlorine bleach.